Senior Airman Matthew Hanning and Staff Sgt. 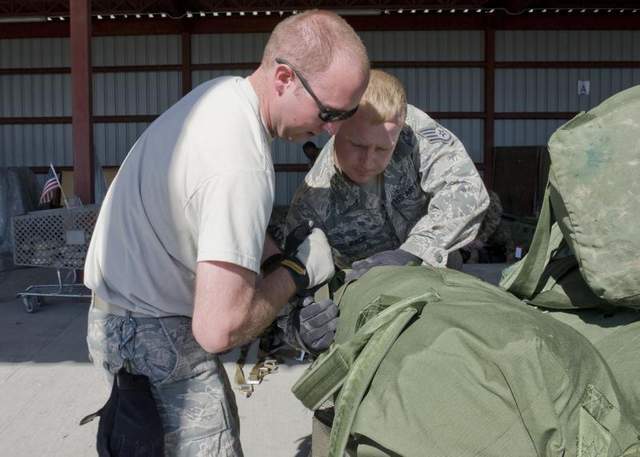 Duane Pace of the 376th Expeditionary Logistics Readiness Squadron tighten a baggage net April 27 at the Transit Center at Manas, Kyrgyzstan. AIR FORCE PHOTO. A recent case of bubonic plague in Kyrgyzstan does not warrant any extra precautions for U.S. personnel at the Transit Center at Manas, according to Air Forces Central Command. On Aug. 22, a 15-year-old Kyrgyz boy died in the Karakol regional hospital after being diagnosed with bubonic plague, Al Jazeera reported. Earlier this year, the Kyrgyz parliament voted to end the U.S. lease on Manas in June 2014. A similar attempt to kick the U.S. out of Kyrgyzstan in 2009 was resolved when the U.S. agreed to pay the Kyrgyz more in rent.